Salvia regla echoes its thrill for days that don’t scorch our souls. Plant this native fall-blooming perennial around your trees for some leaf canopy fireworks, especially if you like hummingbirds. The bees love native Frostweed (Verbesina virginica). I planted it, too, because I was told its flowers are one of the few whites that attract butterflies. But get this, the primrose jasmine is also on a roll, like the Bradford pears and redbuds that have pushed up the calendar. I’ve been planting like a fiend, since any rain will stick around in the soil a bit longer. (And thank you for Tuesday’s blessing to soak in the newbies). New plants don’t punk out so fast when it’s not 105°, either. I carry my list around with me, but LOVE it when I run head first into new inspiration, like this “little leaf” or dwarf Jerusalem sage (Phlomis lanata) on my excursion to Reid’s Nursery. It is doggoned cute; I had to have a couple. These are great fuzzy wuzzy plants for kids, which ta da, leads to Tom’s fabulosa meeting with author Sharon Lovejoy this week. I bet you already have all her books, but the latest is Toad Cottages & Shooting Stars. Sharon’s geared it for grandma fun, but young parents and non-parents like me can have crazy fun with this book! It’s full of activities, recipes, and adventures for any age. With her own illustrations (multi-talented one that she is) Sharon’s got lots of ideas for indoor games and crafting memories that last a lifetime. But on CTG, she sparks childhood imagination and connections to life outdoors. Isn’t that a great gift to give to the next generation? 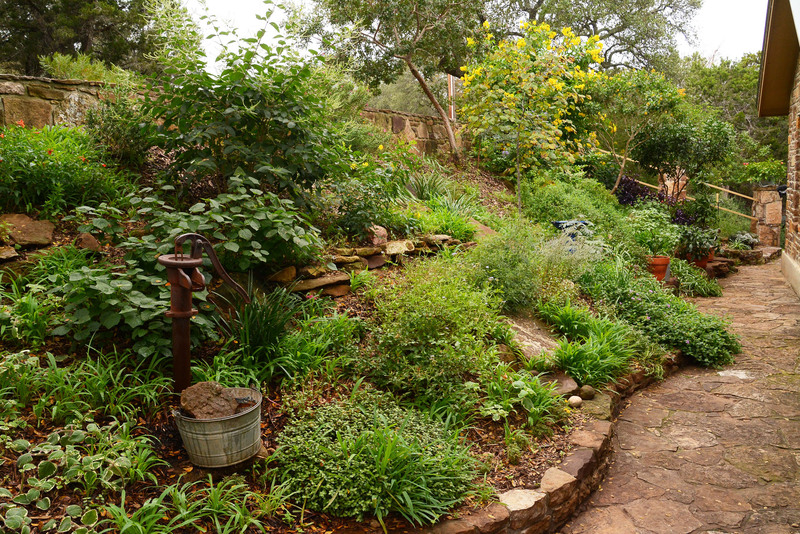 And check out the section on straw bale gardens, perfect for those rocky soil spots. Here’s a picture that Sharon and Jeff nabbed at the Sunset magazine exhibit at the San Francisco Flower and Garden Show. But let’s not forget another kiddie fave: pizza! On CTG day, Jeff Prostovich quickly crafted this solar oven from a pizza box. Jeff’s a multi-talented person himself. Although he’s usually behind the scenes, he’s really on the scene for everything, between his “day gig.” Thank you, dear Sharon & Jeff for joining us again at CTG! Daphne’s pick of the week is snapdragons, a favorite for children to snap their “dragon” mouths. But they’re also favored by gardeners for cool-weather color. When I took pictures at Shoal Creek Nursery, the bees reminded me that it was a winter nectar source for them, too. So, last weekend, I got some dwarf yellow for the front walk. I picked taller, spicy ‘Crimson Sonnet’ for the crape bed. I don’t like to plant them until we’re not seeing too many days of high 80’s. Now’s the perfect time to add some snap to your garden! Boy howdy, I’ve been moving plants around. This week, Daphne answers Ramona Rogahn’s great question: when to move a rose? This past summer and hot fall, our nurturing instinct prompted us to want to move stressed or poorly sited plants to less anxious spots. But, as Daphne explains, hot weather–especially when a plant is stressed–is the worst time to move them. Instead, wait until cooler weather and the plants are dormant to make your moves. In these dry times, be sure to water the plant and its new location several days in advance. Dig your new hole. You may need to make adjustments, but get the hard digging out of the way. It’s also good to take a shovel around your plant a month or even two months before you move it. This will sever some roots and encourage new top ones to grow to help it establish more quickly in its new location. If you can’t do that (and honestly, I’m never that prepared! ), be sure to scrabble around and get as much of the root ball as you can. Moist soil really helps for the digging, and to have the plant well hydrated to reduce a freak out moment. Do not fertilize your new transplants. I give them water, liquid seaweed, and mulch. Well, chippy weather is on the way, which means basil is about to say farewell. Perennials like Mexican mint marigold will brown to the ground in the first freeze. This week, we repeat Trisha Shirey’s tips for preserving and drying herbs to keep the herbal handshake all winter. And how cool would it be to for the child in your life to make holiday oils, vinegars and cat treats from the garden? On tour, we head to the Casis Elementary vegetable garden, where teachers, parents, and students collaborate in an organic vegetable garden for hands-on lessons in sustainability, math, science, art, and plain good eating!